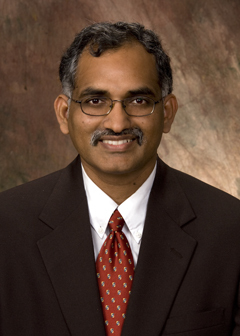 Professor Damodaran’s expertise is in the area of large-scale optimization, logistics, simulation, scheduling, Lean and Six Sigma. He has developed several mixed-integer linear formulations and novel algorithms to solve decision problems arising in many real-life applications such as feature upgrades for notebook computer manufacturers; cell placement problem in VLSI physical design; scheduling batch processing machines in electronics manufacturing; order acceptance, lot sizing and detailed scheduling in make-to-order enterprises; crew scheduling for cruise lines; railroad scheduling; warehousing and distribution. He has also developed simulation optimization models to analyze server assembly facilities, sensor assembly lines and snow removal planning. Much of his research in electronics manufacturing is geared towards eliminating lead from assembly, process improvements and application of lean and six sigma principles. He has closely worked with several industries on problems which are critical to their growth. He is interested in working on real-life, challenging problems which are in the critical path of an organizations growth.